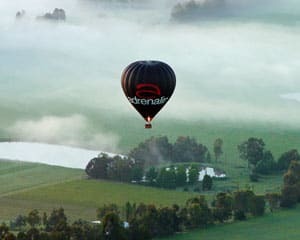 Equally thrilling and relaxing, a hot-air ballooning adventure is a pure and unforgettable experience – especially over the beautiful Yarra Valley. Depending on the wind direction you'll take your tranquil hot-air balloon flight over the Yarra River with breathtaking views of the mountains. The still morning air makes flying conditions perfect during what is known in the hot-air ballooning industry as the "weather window", a gloriously quiet time over the peaceful region. Flights operate every weekend, weather permitting. Weekday flights are available but subject to minimum numbers. The Yarra Valley is about a one hour drive from Melbourne with a gourmet breakfast at the charming Yarra Valley Lodge. Meeting time is half an hour before sunrise. I had a wonderful experience and loved the whole adventure from start to finish and the staff where exceptional. I would Highly recommend this experience to everyone and I am doing that.